The Ontario Hockey League is the number one supplier of talent to the National Hockey League with 2,319 players selected in the NHL Draft from 1969 through 2017 representing close to 21% of all players. Since 1975, a total of 315 OHL players have been selected in the first round of the NHL Draft representing approximately 29% of all players and includes 16 first overall picks. Last season, five OHL players were selected in the first round of the 2017 NHL Draft led by Owen Tippett of the Mississauga Steelheads chosen tenth overall by the Florida Panthers. 1 (16 players) – Connor McDavid (C), Erie (2015 – Edmonton) / Aaron Ekblad (D), Barrie (2014 – Florida) / Nail Yakupov (RW), Sarnia (2012 – Edmonton) / Taylor Hall (LW), Windsor (2010 – Edmonton) / John Tavares (C), London (2009 – NY Islanders) / Steven Stamkos (C), Sarnia (2008 – Tampa Bay) / Patrick Kane (RW), London (2007 – Chicago) / Rick Nash (LW), London (2002 – Columbus) / Joe Thornton (C), Sault Ste. Marie (1997 – Boston) / Bryan Berard (D), Detroit (1995 – Ottawa) / Ed Jovanovski (D), Windsor (1994 – Florida) / Eric Lindros (C), Oshawa (1991 – Quebec) / Owen Nolan (RW), Cornwall (1990 – Quebec) / Bobby Smith (C), Ottawa (1978 – Minnesota) / Dale McCourt (C), St. Catharines (1977 – Detroit) / Rick Green (D), London (1976 – Washington). 2 (13 players) – Gabriel Landeskog (LW), Kitchener (2011 – Colorado) / Tyler Seguin (C), Plymouth (2010 – Boston) / Drew Doughty (D), Guelph (2008 – Los Angeles) / Jordan Staal (C), Peterborough (2006 – Pittsburgh) / Bobby Ryan (RW), Owen Sound (2005 – Anaheim) / Eric Staal (C), Peterborough (2003 – Carolina) / Jason Spezza (C), Windsor (2001 – Ottawa) / David Legwand (C), Plymouth (1998 – Nashville) / Chris Pronger (D), Peterborough (1993 – Hartford) / Brendan Shanahan (RW), London (1987 – New Jersey) / Kirk Muller (LW), Guelph (1984 – New Jersey) / Brian Bellows (LW), Kitchener (1982 – Minnesota) / Doug Smith (C), Ottawa (1981 – Los Angeles). 3 (11 players) – Dylan Strome (C), Erie (2015 – Arizona) / Alex Galchenyuk (C), Sarnia (2012 – Montreal) / Erik Gudbranson (D), Kingston (2010 – Florida) / Matt Duchene (C), Brampton (2009 – Colorado) / Zach Bogosian (D), Peterborough (2008 – Atlanta) / Nathan Horton (C), Oshawa (2003 – Florida) / Chris Gratton (C), Kingston (1993 – Tampa Bay) / Keith Primeau (C), Niagara Falls (1990 – Detroit) / Scott Thornton (LW), Belleville (1989 – Toronto) / Craig Wolanin (D), Kitchener (1985 – New Jersey) / Mike Foligno (RW), Sudbury (1979 – Detroit). 4 (18 players) – Mitchell Marner (RW), London (2015 – Toronto) / Sam Bennett (C), Kingston (2014 – Calgary) / Alex Pietrangelo (D), Niagara (2008 – St. Louis) / Benoit Pouliot (LW), Sudbury (2005 – Minnesota) / Stephen Weiss (C), Plymouth (2001 – Florida) / Rostislav Klesla (D), Brampton (2000 – Columbus) / Bryan Allen (D), Oshawa (1998 – Vancouver) / Alexander Volchkov (LW), Barrie (1996 – Washington) / Chad Kilger (LW), Kingston (1995 – Anaheim) / Jason Bonsignore (C), Niagara Falls (1994 – Edmonton) / Todd Warriner (LW), Windsor (1992 – Quebec) / Mike Ricci (C), Peterborough (1990 – Philadelphia) / Darrin Shannon (LW), Windsor (1988 – Pittsburgh) / Jim Sandlak (RW), London (1985 – Vancouver) / Al Iafrate (D), Belleville (1984 – Toronto) / Steve Yzerman (C), Peterborough (1983 – Detroit) / Ron Francis (C), Sault Ste. Marie (1981 – Hartford) / Larry Murphy (D), Peterborough (1980 – Los Angeles). 5 (11 players) – Olli Juolevi (D), London (2016 – Vancouver) / Michael Dal Colle (LW), Oshawa (2014 – NY Islanders) / Ryan Strome (C), Niagara (2011 – NY Islanders) / Raffi Torres (LW), Brampton (2000 – NY Islanders) / Tim Connolly (C), Erie (1999 – NY Islanders) / Richard Jackman (D), Sault Ste. Marie (1996 – Dallas) / Jeff O’Neill (C), Guelph (1994 – Hartford) / Scott Stevens (D), Kitchener (1982 – Washington) / Joe Cirella (D), Oshawa (1981 – Colorado) / Mike Gillis (LW), Kingston (1978 – Colorado) / Mike Crombeen (RW), Kingston (1977 – Cleveland). 6 (17 players) – Matthew Tkachuk (LW), London (2016 – Calgary) / Pavel Zacha (C), Sarnia (2015 – New Jersey) / Sean Monahan (C), Ottawa (2013 – Calgary) / Sam Gagner (C), London (2007 – Edmonton) / Brian Finley (G), Barrie (1999 – Nashville) / Rico Fata (LW), London (1998 – Calgary) / Daniel Tkaczuk (C), Barrie (1997 – Calgary) / Boyd Devereaux (C), Kitchener (1996 – Edmonton) / Cory Stillman (LW), Windsor (1992 – Calgary) / Adam Bennett (D), Sudbury (1989 – Chicago) / Scott Pearson (LW), Kingston (1988 – Toronto) / Brad Dalgarno (RW), Hamilton (1985 – NY Islanders) / John MacLean (RW), Oshawa (1983 – New Jersey) / Paul Coffey (D), Kitchener (1980 – Edmonton) / Craig Hartsburg (D), Sault Ste. Marie (1979 – Minnesota) / Behn Wilson (D), Kingston (1978 – Philadelphia) / Doug Wilson (D), Ottawa (1977 – Chicago). 7 (13 players) – Darnell Nurse (D), Sault Ste. Marie (2013 – Edmonton) / Mark Scheifele (C), Barrie (2011 – Winnipeg) / Jeff Skinner (C), Kitchener (2010 – Carolina) / Nazem Kadri (C), London (2009 – Toronto) / Manny Malhotra (C), Guelph (1998 – NY Rangers) / Paul Mara (D), Sudbury (1997 – Tampa Bay) / Jamie Storr (G), Owen Sound (1994 – Los Angeles) / Jason Arnott (C), Oshawa (1993 – Edmonton) / Alek Stojanov (RW), Hamilton (1991 – Vancouver) / Luke Richardson (D), Peterborough (1987 – Toronto) / Shawn Burr (LW), Kitchener (1984 – Detroit) / Mark Hunter (RW), Brantford (1981 – Montreal) / Rick Lanz (D), Oshawa (1980 – Vancouver). 8 (11 players) – Alexander Nylander (LW), Mississauga (2016 – Buffalo) / Alexander Burmistrov (C), Barrie (2010 – Atlanta) / Mikkel Boedker (LW), Kitchener (2008 – Phoenix) / Nikita Alexeev (RW), Erie (2000 – Tampa Bay) / Taylor Pyatt (LW), Sudbury (1999 – NY Islanders) / Mark Bell (LW), Ottawa (1998 – Chicago) / Brandon Convery (C), Sudbury (1992 – Toronto) / Derian Hatcher (D), North Bay (1990 – Minnesota) / Shayne Corson (LW), Brantford (1984 – Montreal) / Andrew McBain (RW), North Bay (1983 – Winnipeg) / David Shand (D), Peterborough (1976 – Atlanta). 9 (16 players) – Mikhail Sergachev (D), Windsor (2016 – Montreal) / Bo Horvat (C), London (2013 – Vancouver) / Dougie Hamilton (D), Niagara (2011 – Boston) / Josh Bailey (C), Windsor (2008 – NY Islanders) / Logan Couture (C), Ottawa (2007 – San Jose) / Petr Taticek (C), Sault Ste. Marie (2002 – Florida) / Michael Rupp (C), Erie (1998 – NY Islanders) / Nick Boynton (D), Ottawa (1997 – Washington) / Brett Lindros (RW), Kingston (1994 – NY Islanders) / Todd Harvey (RW), Detroit (1993 – Dallas) / John Slaney (D), Cornwall (1990 – Washington) / Bryan Fogarty (D), Kingston (1987 – Quebec) / Craig Duncanson (RW), Sudbury (1985 – Los Angeles) / Mike Bullard (C), Brantford (1980 – Pittsburgh) / Willie Huber (D), Hamilton (1978 – Detroit) / Scott Campbell (D), London (1977 – St. Louis). 10 (11 players) – Owen Tippett (RW), Mississauga (2017 – Florida) / Nick Ritchie (LW), Peterborough (2014 – Anaheim) / Slater Koekkoek (D), Peterborough (2012 – Tampa Bay) / Cody Hodgson (C), Brampton (2008 – Vancouver) / Boris Valabik (D), Kitchener (2004 – Atlanta) / Branislav Mezei (D), Belleville (1999 – NY Islanders) / Drake Berehowsky (D), Kingston (1990 – Toronto) / Dan Gratton (C), Oshawa (1985 – Los Angeles) / Jim Fox (RW), Ottawa (1980 – Los Angeles) / Tom McCarthy (LW), Oshawa (1979 – Minnesota) / Tim Higgins (RW), Ottawa (1978 – Chicago). 11 (12 players) – Gabriel Vilardi (C), Windsor (2017 – Los Angeles) / Logan Brown (C), Windsor (2016 – Ottawa) / Lawson Crouse (LW), Kingston (2015 – Florida) / Ryan Ellis (D), Windsor (2009 – Nashville) / Jeff Carter (C), Sault Ste. Marie (2003 – Philadelphia) / Jeff Heerema (RW), Sarnia (1998 – Carolina) / Jason Ward (RW), Erie (1997 – Montreal) / Chris Govedaris (LW), Toronto (1988 – Hartford) / Adam Creighton (C), Ottawa (1983 – Buffalo) / Brad Marsh (D), London (1978 – Atlanta) / John Anderson (RW), Toronto (1977 – Toronto) / Paul Gardner (C), Oshawa (1976 – Kansas City). 12 (21 players) – Michael McLeod (C), Mississauga (2016 – New Jersey) / Brendan Perlini (LW), Niagara (2014 – Arizona) / Max Domi (C), London (2013 – Phoenix) / Ryan Murphy (D), Kitchener (2011 – Carolina) / Cam Fowler (D), Windsor (2010 – Anaheim) / Calvin de Haan (D), Oshawa (2009 – NY Islanders) / Bryan Little (C), Barrie (2006 – Atlanta) / Marc Staal (D), Sudbury (2005 – NY Rangers) / Steve Eminger (D), Kitchener (2002 – Washington) / Denis Shvidki (RW), Barrie (1999 – Florida) / Rob Pearson (RW), Belleville (1989 – Toronto) / Corey Foster (D), Peterborough (1988 – New Jersey) / Keith Osborne (RW), North Bay (1987 – St. Louis) / Gary Roberts (LW), Ottawa (1984 – Calgary) / Dave Gagner (C), Brantford (1983 – NY Rangers) / James Kyte (D), Cornwall (1982 – Winnipeg) / Tony Tanti (RW), Oshawa (1981 – Chicago) / Rik Wilson (D), Kingston (1980 – St. Louis) / Paul Reinhart (D), Kitchener (1979 – Atlanta) / Trevor Johansen (D), Toronto (1977 – Toronto) / Peter Lee (RW), Ottawa (1976 – Montreal). 13 (13 players) – Nick Suzuki (C), Owen Sound (2017 – Vegas) / Radek Faksa (C), Kitchener (2012 – Dallas) / Zack Kassian (RW), Peterborough (2009 – Buffalo) / Dustin Brown (RW), Guelph (2003 – Los Angeles) / Michael Henrich (RW), Barrie (1998 – Edmonton) / Daniel Cleary (RW), Belleville (1997 – Chicago) / Derek King (LW), Sault Ste. Marie (1985 – NY Islanders) / Dan Quinn (C), Belleville (1983 – Calgary) / David Shaw (D), Kitchener (1982 – Quebec) / Ron Meighan (D), Niagara Falls (1981 – Minnesota) / Doug Sulliman (LW), Kitchener (1979 – NY Rangers) / Ron Duguay (C), Sudbury (1977 – NY Rangers) / Rod Schutt (LW), Sudbury (1976 – Montreal). 14 (12 players) – Patrick Desrochers (G), Sarnia (1998 – Phoenix) / Jay McKee (D), Niagara Falls (1995 – Buffalo) / Ethan Moreau (LW), Niagara Falls (1994 – Chicago) / Pat Peake (C), Detroit (1991 – Washington) / Brad May (LW), Niagara Falls (1990 – Buffalo) / Terry Carkner (D), Peterborough (1984 – NY Rangers) / Paul Lawless (LW), Windsor (1982 – Hartford) / Jim Malone (C), Toronto (1980 – NY Rangers) / Dan Lucas (RW), Sault Ste. Marie (1978 – Philadelphia) / Ric Seiling (RW), St. Catharines (1977 – Buffalo) / Alex McKendry (LW), Sudbury (1976 – NY Islanders) / Doug Halward (D), Peterborough (1975 – Boston). 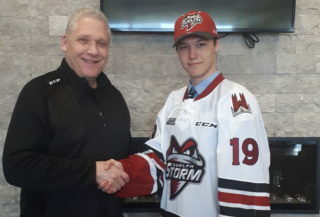 15 (13 players) – Zachary Senyshyn (RW), Sault Ste. Marie (2015 – Boston) / Cody Ceci (D), Ottawa (2012 – Ottawa) / Peter Holland (C), Guelph (2009 – Anaheim) / Ryan O’Marra (C), Erie (2005 – NY Islanders) / Matt Zultek (C), Ottawa (1997 – Los Angeles) / Jeff Ware (D), Oshawa (1995 – Toronto) / Jason Soules (D), Niagara Falls (1989 – Edmonton) / David Latta (LW), Kitchener (1985 – Quebec) / Trevor Stienburg (RW), Guelph (1984 – Quebec) / Bob Errey (LW), Peterborough (1983 – Pittsburgh) / Chris Kontos (C), Toronto (1982 – NY Rangers) / Al MacInnis (D), Kitchener (1981 – Calgary) / Jerome Dupont (D), Toronto (1980 – Chicago). 16 (12 players) – Jakob Chychrun (D), Sarnia (2016 – Arizona) / Nikita Zadorov (D), London (2013 – Buffalo) / Tom Wilson (RW), Plymouth (2012 – Washington) / Nick Stajduhar (D), London (1993 – Edmonton) / Bryan Marchment (D), Belleville (1987 – Winnipeg) / Roger Belanger (C), Kingston (1984 – Pittsburgh) / Dave Andreychuk (LW), Oshawa (1982 – Buffalo) / Steve Smith (D), Sault Ste. Marie (1981 – Philadelphia) / Jay Wells (D), Kingston (1979 – Los Angeles) / Al Secord (LW), Hamilton (1978 – Boston) / Dwight Foster (RW), Kitchener (1977 – Boston) / Tim Young (C), Ottawa (1975 – Los Angeles). 17 (10 players) – Joey Hishon (C), Owen Sound (2010 – Colorado) / Carlo Colaiacovo (D), Erie (2001 – Toronto) / Martin Skoula (D), Barrie (1998 – Colorado) / Wayne Primeau (C), Owen Sound (1994 – Buffalo) / Jason Allison (C), London (1993 – Washington) / Shayne Stevenson (RW), Kitchener (1989 – Boston) / Andrew Cassels (C), Ottawa (1987 – Montreal) / Kevin Hatcher (D), North Bay (1984 – Washington) / Dave Hunter (LW), Sudbury (1978 – Montreal) / Mark Suzor (D), Kingston (1976 – Philadelphia). 18 (14 players) – Logan Stanley (D), Windsor (2016 – Winnipeg) / Austin Watson (LW), Peterborough (2010 – Nashville) / Chris Stewart (RW), Kingston (2006 – Colorado) / Ryan Parent (D), Guelph (2005 – Nashville) / Brad Brown (D), North Bay (1994 – Montreal) / Glen Murray (RW), Sudbury (1991 – Boston) / Shawn Antoski (LW), North Bay (1990 – Vancouver) / Robert Cimetta (LW), Toronto (1988 – Boston) / Jody Hull (RW), Peterborough (1987 – Hartford) / Ken McRae (C), Sudbury (1986 – Quebec) / Bruce Cassidy (D), Ottawa (1983 – Chicago) / Tim Coulis (LW), Hamilton (1978 – Washington) / Bruce Baker (RW), Ottawa (1976 – Montreal) / Alex Forsyth (C), Kingston (1975 – Washington). 19 (6 players) – Anthony DeAngelo (D), Sarnia (2014 – Tampa Bay) / Kerby Rychel (LW), Windsor (2013 – Columbus) / Jakub Kindl (D), Kitchener (2005 – Detroit) / Yvon Corriveau (LW), Toronto (1985 – Washington) / Jeff Beukeboom (D), Sault Ste. Marie (1983 – Edmonton) / Paul Gagne (LW), Windsor (1980 – Colorado). 20 (10 players) – Robert Thomas (C), London (2017 – St. Louis) / Scott Laughton (C), Oshawa (2012 – Philadelphia) / Michael Del Zotto (D), Oshawa (2008 – NY Rangers) / Brent Burns (D), Brampton (2003 – Minnesota) / Daniel Paille (LW), Guelph (2002 – Buffalo) / Mike Wilson (D), Sudbury (1993 – Vancouver) / Steven Rice (RW), Kitchener (1989 – NY Rangers) / Darren Rumble (D), Kitchener (1987 – Philadelphia) / Kerry Huffman (D), Guelph (1986 – Philadelphia) / Scott Metcalfe (LW), Kingston (1985 – Edmonton). 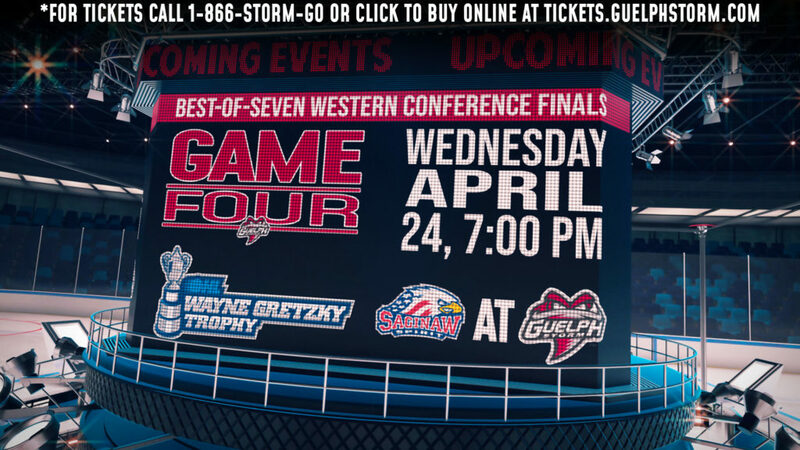 21 (10 players) – Robby Fabbri (C), Guelph (2014 – St. Louis) / Stefan Noesen (RW), Plymouth (2011 – Ottawa) / Bobby Sanguinetti (D), Owen Sound (2006 – NY Rangers) / Wojtek Wolski (LW), Brampton (2004 – Colorado) / Nick Boynton (D), Ottawa (1999 – Boston) / Sean Brown (D), Belleville (1995 – Boston) / Trevor Halverson (RW), North Bay (1991 – Washington) / Steve Bancroft (D), Belleville (1989 – Toronto) / Glen Seabrooke (C), Peterborough (1985 – Philadelphia / Mike Stothers (D), Kingston (1980 – Philadelphia). 22 (5 players) – Olli Maatta (D), London (2012 – Pittsburgh) / Matt Lashoff (D), Kitchener (2005 – Boston) / Nik Tselios (D), Belleville (1997 – Carolina) / Jeff Brown (D), Sarnia (1996 – NY Rangers) / Curtis Bowen (LW), Ottawa (1992 – Detroit). 23 (6 players) – Tyler Cuma (D), Ottawa (2008 – Minnesota) / Ben Eager (LW), Oshawa (2002 – Phoenix) / Tim Gleason (D), Windsor (2001 – Ottawa) / Craig Hillier (G), Ottawa (1996 – Pittsburgh) / Todd Bertuzzi (RW), Guelph (1993 – NY Islanders) / Grant Marshall (RW), Ottawa (1992 – Toronto). 24 (8 players) – Max Jones (LW), London (2016 – Anaheim) / Travis Konecny (RW), Ottawa (2015 – Philadelphia) / Jared McCann (C), Sault Ste. Marie (2014 – Vancouver) / Malcolm Subban (G), Belleville (2012 – Boston) / Matt Puempel (LW), Peterborough (2011 – Ottawa) / Mike Richards (C), Kitchener (2003 – Philadelphia) / Lukas Krajicek (D), Peterborough (2001 – Florida) / Brad Boyes (C), Erie (2000 – Toronto). 25 (5 players) – Stuart Percy (D), Mississauga (2011 – Toronto) / Greg Nemisz (C), Windsor (2008 – Calgary) / Robbie Schremp (C), London (2004 – Edmonton) / Anthony Stewart (RW), Kingston (2003 – Florida) / Steve Ott (C), Windsor (2000 – Dallas). 26 (4 players) – Brendan Gaunce (C), Belleville (2012 – Vancouver) / Matt Pelech (D), Sarnia (2005 – Calgary) / Kevin Grimes (D), Kingston (1997 – Colorado) / Dan Cloutier (G), Sault Ste. Marie (1994 – NY Rangers). 27 (4 players) – Morgan Frost (C), Sault Ste. 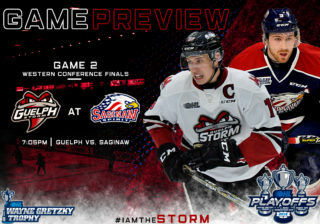 Marie (2017 – Philadelphia) / Nikolay Goldobin (RW), Sarnia (2014 – San Jose) / Vladislav Namestnikov (C), London (2011 – Tampa Bay) / Mark Visentin (G), Niagara (2010 – Phoenix). 28 (4 players) – Joshua Ho-Sang (RW), Windsor (2014 – NY Islanders) / Nick Foligno (LW), Sudbury (2006 – Ottawa) / Corey Perry (RW), London (2003 – Anaheim) / Justin Williams (RW), Plymouth (2000 – Philadelphia). 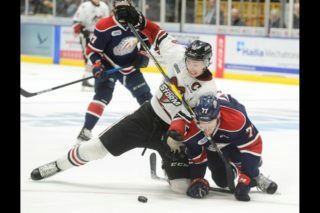 29 (4 players) – Jason Dickinson (C), Guelph (2013 – Dallas) / Nicklas Jensen (RW), Oshawa (2011 – Vancouver) / Steve Downie (RW), Windsor (2005 – Philadelphia) / Adam Munro (G), Erie (2001 – Chicago). 30 (5 players) – Ryan Hartman (RW), Plymouth (2013 – Chicago) / Tanner Pearson (LW), Barrie (2012 – Los Angeles) / Rickard Rakell (RW), Plymouth (2011 – Anaheim) / Thomas McCollum (G), Guelph (2008 – Detroit) / Matthew Corrente (D), Saginaw (2006 – New Jersey).